Bodenständig 2000 are two german boys who played too much videogames in their former youth. They grew up in the 4th quarter of the 20th century -- an age where the rapid development of technology made the power of home computing available to everyone. After some heavy and finally failed efforts to get rich by developing and selling the soundtracker-like music software "Deluxe Mjuzakk Zerbastel Kit", they simply decided to become popstars. Cause, as these friendly boys next door always say: "In this business, it is nearly impossible that the industy would steamroll us one month after we began a new project, as even Sony does not seem to have any giant farms where they breed their own popstars until now (although we sometimes hesitate if we see Whitney Houston)". Using the above mentioned "Deluxe Mjuzakk Zerbastel Kit" and numerous other devices they bought from pocket money, Bodenständig 2000 now create the definite sound for the generation that was born next to flickering screens. 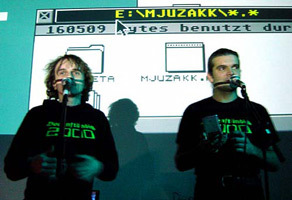 The outstanding german lyrics, subtle poems telling from their lives as cablefreaks and computer kids, are of such explosiveness, that only the the brave british label Rephlex Records was able to publish the songs. (German labels for electronic music only publish english lyrics, for security reasons). Although they produce extremly cheap and street credible, Bodenständig 2000 stand for maximum commerciality and first class sales figures. Every tune on the debut album "Maxi German Rave Blast Hits 3" (Rephlex Records) was a huge hit: on the dancefloor as much as in the thoughtfull moments of life. Today, the two non-pretentious boys also publish on other labels like micromusic.net or Beige Records/USA and invade the whole world with their incredibly giant live electronic rock shows, that the unprepared customer could easily find rather contrasting to their minimalistic homecomputer setup. Bernhard Kirsch, the older member of Bodenständig 2000, is the first decent musician after Boney M. coming from the Saarland. He was the first boy in class who soldered a sound device for the Commodore PET. Being too lazy to type out other people's boring games for his Commodore 64 from the early 80's home computer magazines, he started to program own games with graphics and music being the main focus. Later, after failing in getting rich with "Deluxe Mjuzakk Zerbastel Kit", he started collecting arcade games and became a popstar due to the inspiration. Like Dragan, he always wanted to be popstar AND scientist, so he worked for a while at the "german research institute for artificial intelligence", DFKI. Besides different design projects, he today develops a revolutionary new kickscooter/street surfboard called Plankalkul that sometimes actually keeps him away from any screen. He sometimes grunts and groans about the triple strain of being a popstar, scientist AND caretaker. Dragan Espenschied got a unix terminal from his dad at the age of 12. He learned to play recorder and home organ, but soon moved over to hi-tech instruments by Atari and Commodore for making music. After trying out the "Deluxe Mjuzakk Zerbastel Kit", he phoned up Bernhard and asked if they maybe should become popstars together. In his spare time, he works as a lecturer and unintentionally awardwinning web artist, worked for some silly multimedia projects at busted new ecomomy companies and started a career as a wild-eyed scientist at Fraunhofer research Institute Stuttgart were he develops 3D-User-Interfaces at the laboratory for immersive interactive virtual reality.